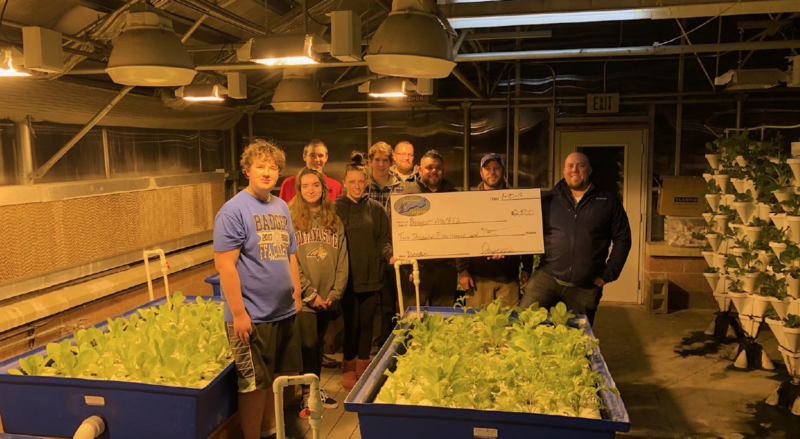 The Badger High School Agriculture Department and FFA uses an Aquaponics system as part of their learning curriculum. They use large tanks in a greenhouse to raise Talapia fish and use the water and subsequent fish waste to grow vegetables such as lettuce and tomatoes. The whole process is documented and monitored by the students in the Ag science classes. When it is ready to be harvested, the produce is then used in the school cafeteria and served at lunch. It was discovered that the water at the school is extremely hard, causing the system’s heater to fail and need to be replaced. As well, a reverse osmosis system needed to be installed to get the hardness and impurity levels in check to prevent that from happening again. The Jaycees donated $2,500 to help them get the system back up and running properly.